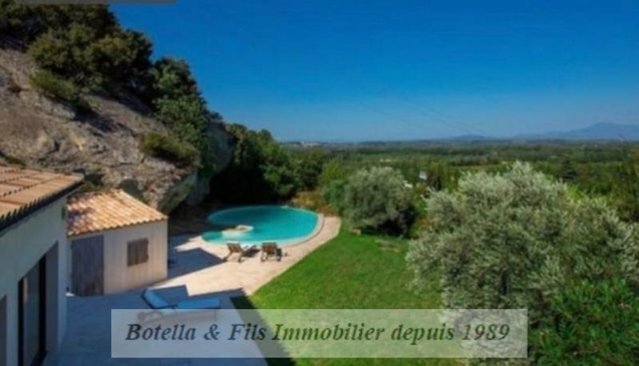 Magnificent and spacious contemporary villa, only 10mins from Avignon and the TGV station, with a breathtaking view over the surrounding countryside. It is composed of a large living room with high ceiling opening onto a sunny terrace, and a fully-equipped “Bulthaup” brand kitchen. 4 bedrooms, each with ensuite. Extremely well presented this property offers a very high standard with floor heating, electric shutters, alarm, videophone, electric gate. It is surrounded by 10.000m² of landscaped garden with Mediterranean plants and an infinity-pool. Agency fees to be paid by the vendor. Botella and sons (since 1989). Réf. 10030.